Our K900 Wall Mountable First Aid Kit ensures that you are covered for High risk level workplaces within one hour medical assistance. It contains trauma dressings, burn treatment, eye wash and strapping tape. If you cut, drill, saw or weld then you need a K900 close by. Mount these kits close to the most likely incident will occur and preferably near running water. The casing is a powder coated metal with stainless steel hinges and built to last. Consider the need for a Fire Extinguisher on your site. Know where your First Aid kit is located at all times. First Aid Training is valid for 3 Years and CPR requires an annual refresher. Stay up to date with the latest First Aid techniques. Why choose First Aid Kits Australia? 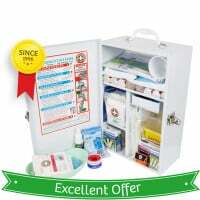 First Aid Kits Australia, entrusted for safer living. Please call us on 1300 789 541 if you have any questions.